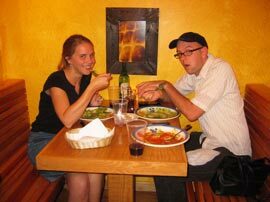 For many a meal eaten out we work under the strategy of “I’ve got a twenty in my wallet and I don’t want to stop at an ATM machine or bust out the credit card.” Often this is just a noble goal (especially for two people) and we end up overshooting, but it does give you a nice starting point for the evening. It also allows for a couple nights out in any given weekend. a.) You are hard-pressed to spend more than $7 on an entree. b.) You can bring your own wine without paying a corkage fee. Not one red cent and they provide a corkscrew and plastic cups (this is huge). We picked up Kari and headed over to Figo, bottle of Zin tucked under the driver’s seat. (No officer, it’s only for emergencies, you know, like road flares and that unregistered pistol in the glovebox.) Katy ran in and double-checked the corkage policy as we were childishly determined not pay anything extra for what had been a free gift of wine. All was clear and we sauntered in and surveyed the menu. At Figo you choose a pasta from one list ($3-4) and a sauce from another (all $2-3). 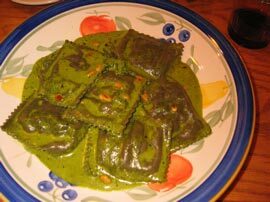 The various raviolis are apparently irresistable as we all chose them. Katy had salmon and leeks; Kari tried the ricotta; I quickly chose the mushroom ones. Woman behind the counter: Sir, you were anything but quick in making your decision. Me: Shut up! That was quick for me. Katy: Josh, let’s go. Kari and I are done eating already. I have a hard time passing up pesto and I tend to like it with a very present garlic flavor. This pesto didn’t have that but some would argue that it was more subtle that way. I enjoyed but I will probably try a different sauce next time. The mushroom ravioli, however, was most delectable. Katy declared hers simple but delicious. The wine was fabulous. The more so for not suffering from the restaurant markup game. Too many times have we seen our everyday, $4 table wine in California (Forestville) go for $20-24 in a restaurant here. 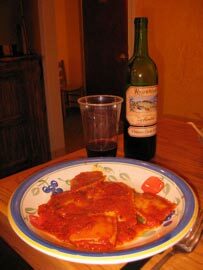 A glass or two of wine can quickly end a cheap eat and it was nice to be able to drink with impunity. Liveblogging Lunch: Which salad should I order?